TODAY's Al Roker reports from New Orleans, La., where Hurricane Isaac has roared ashore with 80 mph winds. Updated at 11:48 p.m. ET: Slow-moving Isaac was downgraded to a tropical storm on Wednesday but left devastation in its wake, flooding homes to their attics when the sea breached a levee outside New Orleans. Inside New Orleans, levees and pumps protected the city from widespread flooding, but Isaac had cut power to a third of Louisiana's households and was expected to lash the state with heavy rain and winds into Friday. The $14 billion spent improving Louisiana's levee system did not include the levees near Plaquemines Parish. 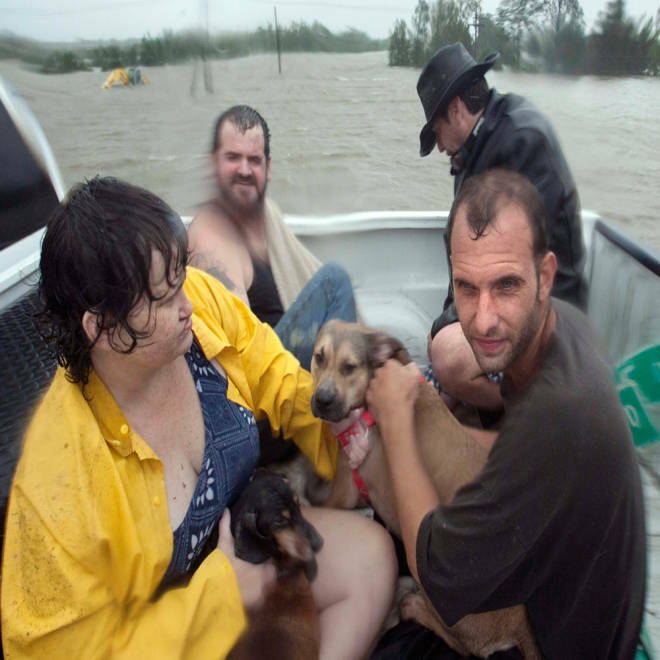 Residents who decided to stay behind when Isaac hit the region had to be rescued from their flooded homes. NBC's Gabe Gutierrez reports. In Plaquemines Parish, National Guardsmen and residents rescued dozens of people trapped in homes. As rains poured, Louisiana Gov. Bobby Jindal warned there was "much more coming." "This is a storm that we’ll be dealing with not only through today and tomorrow," Jindal said. "We’re going to continue to see the weather effects of the storm especially as it moves to the northern part of our state." The storm has tested the city's post-Katrina flood defenses, leaving many roads impassable and creating a storm surge from Louisiana to Alabama. NBC's Lester Holt reports. Jindal sent a letter to the federal government requesting an expedited major disaster declaration for the state. President Barack Obama signed disaster declarations for Louisiana and Mississippi later Wednesday evening to supplement state and local recovery efforts beginning on Aug. 26, according to a White House statement. Jindal estimated damages to state and local agencies at $24 million as of Wednesday afternoon, according to Nola.com. The 10 p.m. CT report from the National Hurricane Center said the eye of Isaac was 15 miles south of Baton Rouge, La., moving northwest at 6 mph. Sustained winds were near 60 mph with higher gusts. A shift in the wind threatened the west side, triggering mandatory evacuations there of 3,000 residents -- among them 112 nursing home residents. With the wind shift, officials also looked at whether to deliberately breach the overtopped levee so that water flushes out more quickly. Mandatory evacuations were also ordered for parts of St. John Parish, Jindal said at a press conference. A downgraded Isaac floods coastal communities and forces new evacuations, but levees still hold. The storm surge also flooded areas of the Mississippi coast with water rising several feet in some parts, authorities said. Weather Channel meteorologist Paul Goodloe reported a number of homes had been flooded in Biloxi Bay, Miss. "The entire stretch of U.S. 90 has been closed from the Bay St. Louis Bridge to the Biloxi Bay Bridge" due to flooding, Goodloe reported. No deaths or injuries were reported, but some 4,000 people were in shelters. The National Weather Service issued flash flood warnings for Orleans Parish, which includes New Orleans, Jefferson Parish, East Bank of Plaquemines Parish, Northwestern Plaquemines Parish, Western St. Bernard Parish and St. Charles Parish in Louisiana and Jackson County, Miss. MSNBC's Tamron Hall speaks with Jesse Shaffer, who is working with others to rescue people trapped by floods in their Louisiana homes. Rick Knabb, director of the National Hurricane Center, told The Weather Channel that the storm's large size meant it was "not going to fall apart real quick." In New Orleans, Mayor Mitch Landrieu ordered a dusk-to-dawn curfew to protect against looting, and said the post-Katrina investment in beefed-up levees and pumps had paid off. "It's holding up," Landrieu told NBC News. "There's no risk of any failure from what we can tell, anywhere." Louisiana Gov. Bobby Jindal says coastal officials may intentionally breach a levee on the east bank of Plaquemines Parish to relieve pressure on the structure. Watch his news conference. "That wind is really, really heavy, which is why it is important that you stay inside," Landrieu earlier warned residents and tourists. Landrieu said City Hall has been calling businesses urging them to open Thursday to help residents without power and supplies. Power crews hope to head out Thursday, possible only if winds slow to 35 mph, Landrieu said. "There are a lot of trees that are down," he added. "We have reports of streets being flooded in the city." Knabb warned that isolated areas would get up to 20 inches of rain with 7 to 14 inches falling over a widespread area. "We're going to see flooding out of this from the freshwater perspective" in addition to the seawater storm surge, he said. The center of Isaac first made landfall as a Category 1 hurricane Tuesday evening with 80-mph winds and then moved back over water before making a second landfall just west of Port Fourchon, La., around 2:15 a.m. local time (3:15 a.m. ET). NBC's Michael Brunker as well as The Associated Press and Reuters contributed to this report.